You never really know how the results of your experiments will pan out, until you dive in and things start to happen. 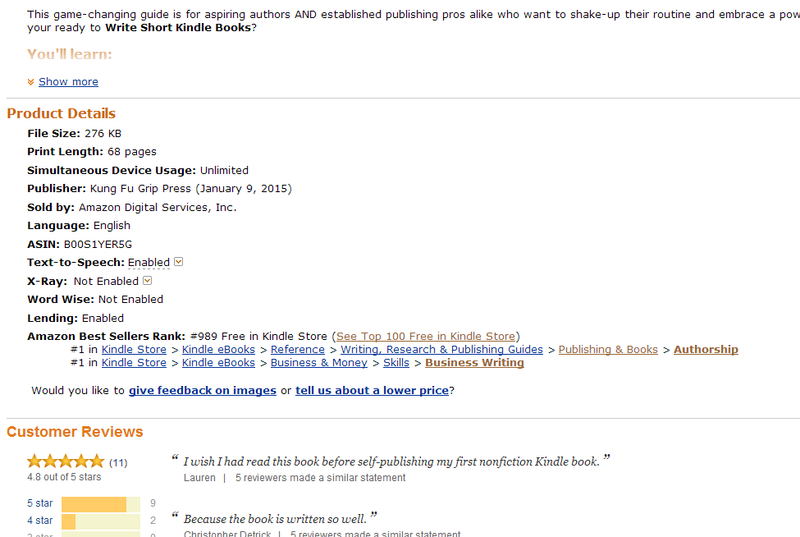 Day One of launching my new book Write Short Kindle Books for FREE went REALLY well! I’m keeping detailed notes on everything I’m doing throughout this launch and the results they yield, and I’ll be sharing that with folks down the line too. But for now, here’s a quick look at what happened! Launching on a Sunday felt a bit weird, but it worked out surprisingly well and with a relatively minimal amount of plugging online. Granted, I did post a bit here and there on FB, Twitter, and beyond, and I reached out to folks on my mailing list and a few other places, but I tried to ease off the trigger a hair with this launch. You’ll still see me posting about it daily here and there throughout the FREE promo, but I’m looking to drive this more through content than just social media blasts. I closed out Day One with 327 downloads and hit #1 in the top 100 bestseller free charts for both of my book’s categories. Now…these are FREE downloads, mind you, so I haven’t made any income off this yet, which (to be honest) makes me a hair nervous, but there are a few strategies behind launching for free. 1) It gets the book in the hands of a lot of readers – I have a fairly decent sized core group of folks who like my other books and follow me on various channels. I’m happy to give them a free book, see what they think, and spread the love. 2) It impacts the book’s Amazon ranking in a BIG way – This book is less niche than my other works, and I’m hoping to get it out to a larger audience of people who aren’t familiar with my current books. To do that, I need the help of my core peeps to drive this bad boy up into the charts to get visibility. 3) It puts more reviews on the board – Amazon reviews, particularly positive ones, can have a REALLY HUGE impact on your books sales, visibility, and whether or not people give it more than a first glance. It can be really tough to get organic reviews, since for every few hundred people who download your book, you’ll be lucky if you get a handful of ratings. I’m really gunning to get a lot more reviews on the board with this book than I have with all of my previous books combined. So if you dig the book and want to leave a review, you can do so HERE! (It only takes 30 seconds). I’m really hoping things keep going at the current pace, because the idea here, is to use the momentum built from this big free promotion to help trigger a lot of paid sales once I flip the switch later this week. So I’m feeling fairly good about things so far. I’m cautiously optimistic, but the REAL results of this launch will spin out in the days to come. I’ve seen this (and other strategies I’m trying) work really well for a lot of other authors. Will it work out in this case? I really hope so. At the very least, people seem to be grabbing the book, and the reviews and feedback so far has been overwhelmingly positive, which feels GREAT! No matter how well you think you might be doing as an author, writer, freelancer, whatever, there are always self-doubts and anxieties that creep in with every new project launch and experiment. Thanks for your support so far and I appreciate the help along the way this week! Grab your copy now for FREE while you can! And please consider leaving a quick review if you enjoyed the book, that means a lot and helps me out a ton! Cheers!